There are few sounds more tranquil than bubbling water, few settings more peaceful than those where you can watch ripples on water. Elements of nature in your yard will create a more enjoyable environment and on the practical side, an improved landscape will increase the value of your home. If your home is your sanctuary, adding a water feature will take the satisfaction level up a couple of notches. A nice lawn and lush plantings are the ground work, but bringing water into the landscape will offer a dramatic touch. There are a wide variety of water features – fountains, ponds, Asian pools to name a few – but before you make any choices on the look, consider these steps to improve your planning process. Make an honest appraisal of your yard. Take in the size, plant materials, light source, activity areas; do a full scope review. Think about the ambience. Does your yard have a cottage feel, is it sculptural, maybe formal? The general feeling and the available space will help you determine if you want a fountain or a waterfall or a pond. 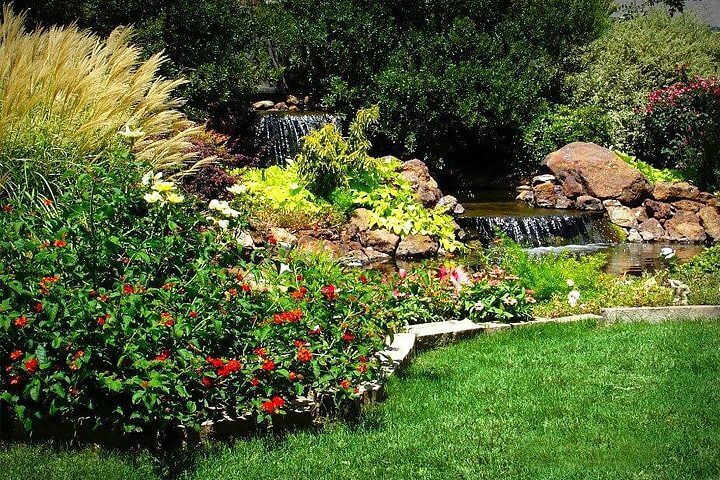 The natural flow of your yard is a major factor in determining the water feature you chose. Are there natural slopes that would be ideal for a waterfall? Is there an existing private corner that would be perfect for a zen koi pond? Would a flat surface look better with a water fountain focal point. If you decide to fit your water feature into the existing terrain that’s terrific, but also consider that the flow of your yard can be altered with the addition of mounds or the elimination of slopes. Perennial, shrubs and trees need to work in unison with your water feature. You can build into an existing landscape or create your desired space by adding new plant life. Water loving plants can be placed around the rim of a pond or even in the pond. Full shrubs can create a private space. Trees can provide shade for a peaceful retreat area. Be sure to think about what types of plantings appeal to you and chose them to compliment to water feature. Would You Enjoy Having Fish? Water creatures will add another level of enjoyment to your feature. Beautiful koi will bring a lovely pop of color to a pond. Frogs will sing you to sleep at night. If animal life appeals to you, plan an environment that will allow them to flourish, but be sure you are prepared for the upkeep because creatures will require extra attention and time. Determining your objectives for your water feature will help you hone in on the design that is most appropriate for you. Are you motivated by your love of nature? Are you just trying to fill up a bland spot? Do you have a passion for water creatures? Being honest and reflective about what you want to accomplish will guide the process and direct you appropriately to create the best possible water feature. The possibilities for water features are numerous. You can go big or small, static or flowing. Fountains can be towering, ponds can be petite. The construction materials to be used could be solid and linear or rustic and free flowing. You may think you know what you want, but if you review a variety of options, you might find something new that touches that happy place in your heart. If there are small children in your family you should carefully consider safety issues, whether it be open water or a climbable structure. If you have lots of parties and family cookouts, you might not want to place a fountain in the middle of the croquet lawn. A water feature is meant to add to the quality of your life outdoors not add limitations. Before you get too deep into daydreaming about your perfect water feature, place a call to your local community to inquire about any restrictions. Ask about permit requirements and the mandated process. Also be sure to check with utility companies about underground lines in your neighborhood. Even if you plan on doing much of the work yourself, a budget outline will be necessary before construction can begin. And a budget should really be determined even before you start reviewing concepts because what you can afford will lead you to the size and scope of your water feature. While you may believe that you are a handy, creative person, it’s always a good idea to consult with landscape professionals before undertaking such a project. They can guide you on design options, most suitable material choices and even build the feature for you. A water feature can truly enhance your landscape and your lifestyle. If magnifies nature, offers tranquility and enhances property values. Don’t undercut the process. Follow these suggestions to build an environment that you will treasure for years to come.